Aliens landed in the squash patch. Yellow and green gnarly star-shape flying saucers, about 4 inches across, are amazingly little sculptures. 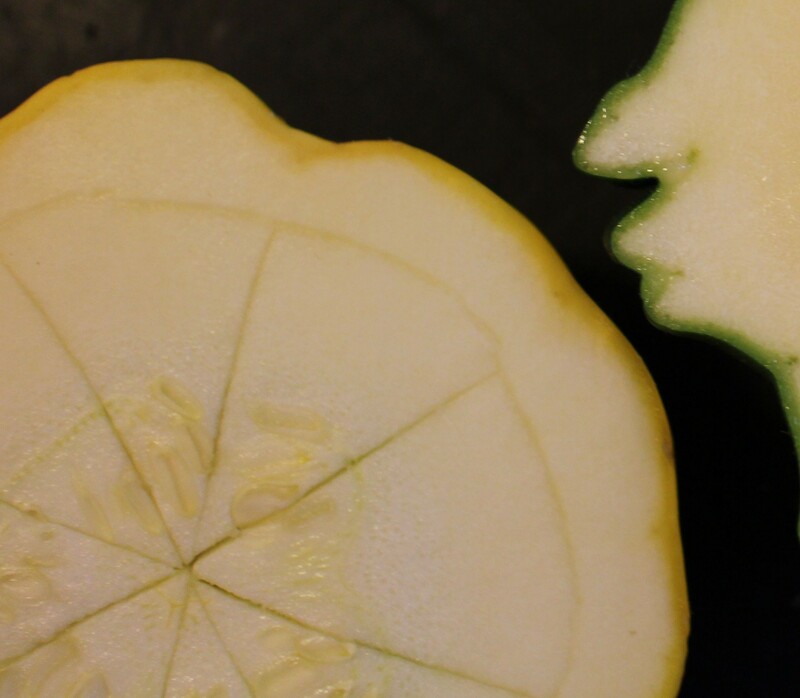 They seem improbable as food, and produce the same kind of wonderment as kohlrabi. And, like insects, they probably offer inspiration for science fiction when greatly expanded in scale. Halved and hollowed, they became shells for a summer medley of corn and squash, punctuated with scallions and held together with the remains of last season’s canned tomato sauce (though you could use this year’s fresh tomatoes). To hollow these flattish squashes without piercing the shell, I score a circle in the center with segments using a grapefruit knife and use a small spoon to scoop out the flesh in large chunks. Sometimes I steam the shells, especially when they’re small, but here, I brushed them lightly with olive oil and roasted them in a hot oven, cut side down, while I made the filling. 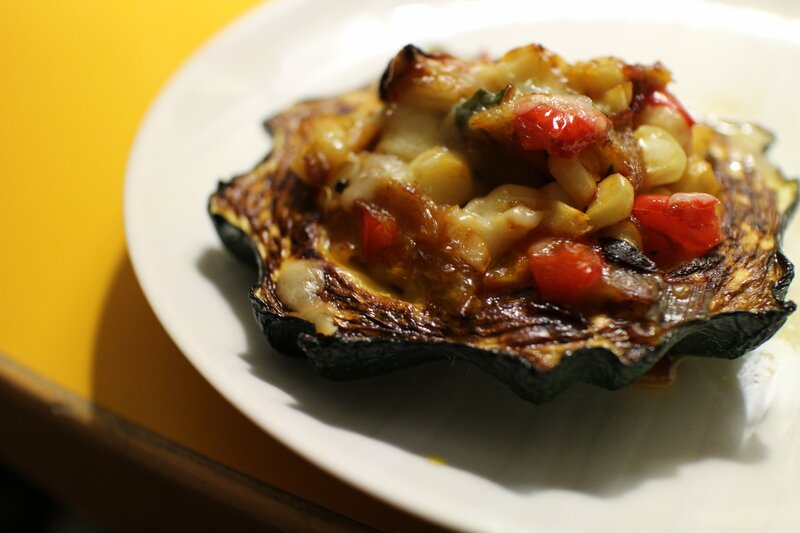 I cooked the chopped squash flesh on the stove until very brown and caramelized, but I could have roasted it along with the shells. 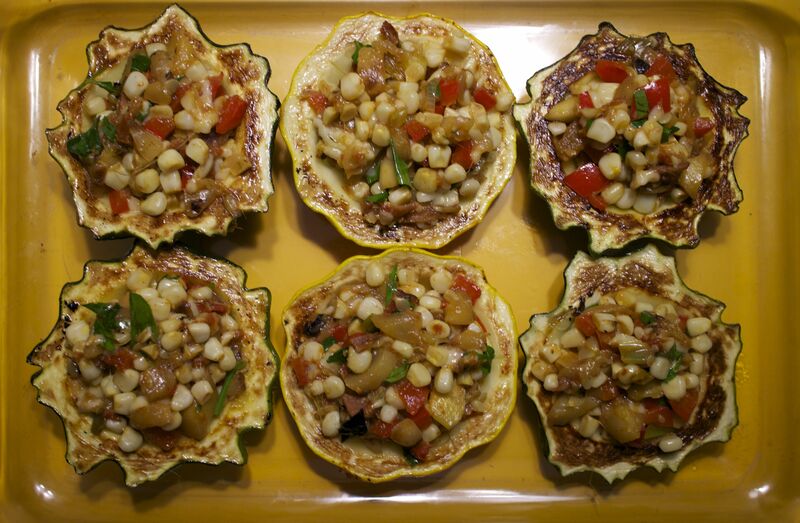 Combined with sautéed corn and scallions and bound together with a few spoons of tomato sauce and grated cheese, it made a summery filling for the squash shells, which were then baked in the oven. Meanwhile, pour a little olive oil into a heavy pan on low heat and sauté the reserved squash over medium high heat until lightly browned and dried out. Add the scallions and corn sauté until they start to soften. Add the tomato sauce or diced fresh tomatoes and stew, reducing the heat. Set aside to cool for a few minutes. Add the basil and cheese and spoon the mixture into the shells. Bake at 350 degrees until slightly bubbling and browned, about 25 minutes. Serves 6 as a side dish, 3-4 as a main dish.